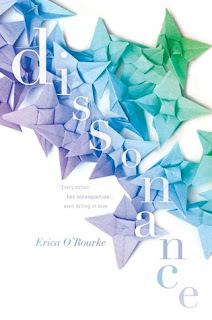 Dissonace by Erica O’Rourke is a Sci-Fi Alternate Universe ride that I was happy to take. Alternate Universes spawned from decisions are definitely my thing. I absolutely loved the way they were conceived in Dissonance. Each decision we make creates an Echo off the key world. Those other Echoes live as normal just as the Key world does, however sometimes the echos are absorbed by other echoes, sometimes they are destroyed and sometimes they find themselves merged back into the Key world. Walkers, like Del, are the people who can travel between these universes keeping “order” and making sure nothing damages the Key world. The walkers have their own form of government called the Consort. So that’s the gist but Erica really expands on how the consort works versus what a walker's job is. I also loved that at the beginning of each chapter it takes a small snippet of information from walker textbooks. The Sci-Fi awesomeness definitely sucked me in but I also enjoyed the characters. Del is the kind of girl who teachers raise their fist in air and shake as they yell Delancy Sullivan, cursing her name. She is hard headed and doesn’t really listen to anyone. She can be selfish and isn’t always thinking about how her actions might have an impact of other people. So basically, she’s a teenager. I did find Del to be impulsive but I liked the fact that she is clever and able to think on her feet. She doesn’t spend time wallowing about things she takes action. I also love the origami stars she leaves behind in each world. Simon is a cute boy and you kind have to combine all his echoes in your head to make him one character. Even though she had different experiences with Simon every time she ran into him, the basics are still Simon. I liked the romance between them, I thought it was cute and sweet. I liked their cute banter. Elliot is a good friend to Del and I think she does know that. They have that awkward, he is in love with her and she pretends he’s not so that it isn’t awkward. Which makes it awkward. Especially when she starts getting together with Simon but at the heart of it all Elliot and Del are still best friends. Del’s relationship with her family is kind of different. It’s not they are not close but with her parents constantly off on a secret mission it seems a little strained. They get pissed that she doesn’t always follow the rules but they aren’t exactly there to enforce them. I did like her relationship with her Grandpa Monty which makes the ending even more interesting. Addie, Del’s sister, seems to hate her most of the time. Sometimes you see that and then at the root you know they love each other. I wasn’t exactly seeing that with them. I loved the plot and the way it was laid out. I loved the writing, the romance and the characters. These are big books but I’m not sure if you could cut anything out because of all the information that needs to get through. I would recommend this for a Sci-Fi lover like me. I actually got the second book for review but needed to catch up reading this first. I didn’t realize how big the books are so I’m a little behind. 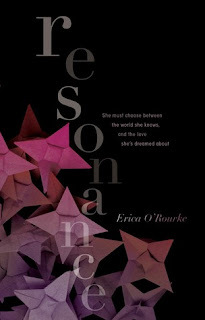 Resonance came out July 21st! So you can binge read like me! I should have my review up this weekend!